Lounge with family and friends on this casual motion sofa. 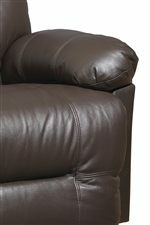 With 3 pad-over-chaise seats, this sofa keeps you comfortable from head to toe, offering an easy-to-use recline as well. Plump pillow arms and line-tufted detail complete the alluring design of this sofa. 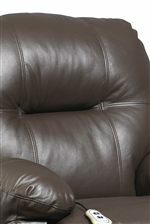 Perfect for family rooms and entertainment centers alike, you can't go wrong with this comfortable and convenient item. This sofa is available in manual and power options. The S501 Zaynah Casual Power Motion Sofa with Pillow Arms by Best Home Furnishings at Best Home Furnishings in the St. Louis, Chesterfield, St. Charles, MO & Waterloo, Belleville, Edwardsville, IL area. Product availability may vary. Contact us for the most current availability on this product. The S501 Zaynah collection is a great option if you are looking for Casual furniture in the St. Louis, Chesterfield, St. Charles, MO & Waterloo, Belleville, Edwardsville, IL area. Browse other items in the S501 Zaynah collection from Best Home Furnishings in the St. Louis, Chesterfield, St. Charles, MO & Waterloo, Belleville, Edwardsville, IL area.